This was a British World War I recruiting poster issued in 1915. 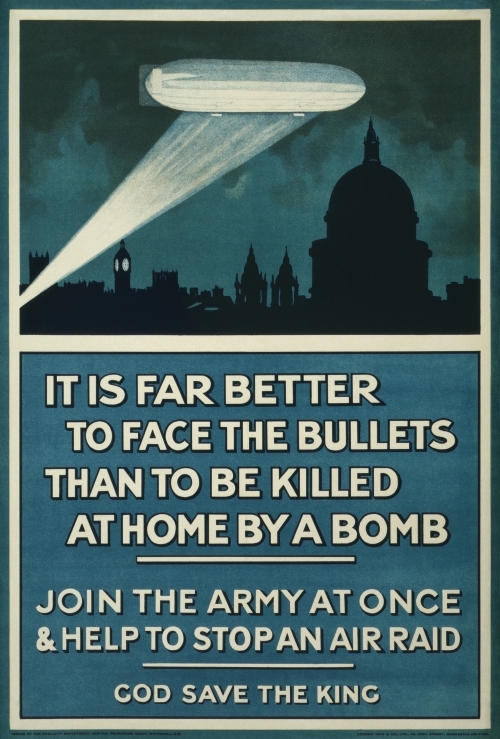 World War II-era British propaganda poster – It is far better to face the bullets than to be killed at home by a bomb. 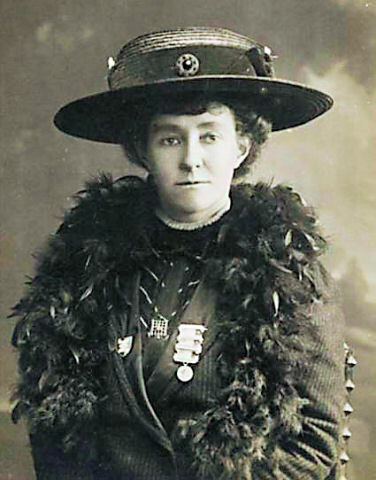 Emily Wilding Davison (11 October 1872 – 8 June 1913) was a militant suffragette who fought for women’s suffrage in Britain. She was jailed on nine occasions and force-fed 49 times. She stepped in front of King George V’s horse Anmer at the Epsom Derby on 4 June 1913, suffering fatal injuries. Her funeral on 14 June 1913 was organised by the Women’s Social and Political Union (WSPU). Thousands of suffragettes accompanied the coffin and tens of thousands of people lined the streets of London. After a service in Bloomsbury, her coffin was taken by train to the family grave in Morpeth, Northumberland. Modern historians agree that Davison was trying to disturb the Derby to draw attention to her cause, rather than to commit suicide, and 2013 analysis of newsreel has supported the idea that Davison was reaching up to attach a scarf to the bridle of the King’s horse. Analysis of newsreel also indicated that her position before she stepped out onto the track would have given her a clear view of the oncoming race, further countering the belief that she ran out in a haphazard way to kill herself. Three UK animal rights extremists received jail sentences ranging from 15 months to four years their part in an illegal campaign against companies that had business relationships with Huntingdon Life Sciences. Mark Taylor, 39; wife Suzanne, 35; and Teresa Portwine, 48, were the first to be charged under new UK laws designed to make it easier to crack down on animal rights extremists who skirted the law in their efforts to harass and intimidate animal research firms and nonprofits. All three plead guilty to conspiracy to interfere with a contractual relationship. Portwine was sentenced to just 15 months, Suzanne Taylor received 2 1/2 years, and Mark Taylor was sentenced to four years in jail. The judge in the case apparently took into account testimony from witnesses that Taylor had been a ring leader of the group’s activities in handing out the sentence. Taylor participated in numerous protests and drove others to said protests where groups of Stop Huntingdon Animal Cruelty activists wearing masks would storm into the offices of the targeted companies. sentenced. D’arcy Doran, Associated Press, March 6, 2007. Animal rights activists are jailed for ‘intimidation’. New Scotsman, March 6, 2007. Animal rights activist jailed. Press Association, March 6, 2007. In 2004, hare coursing was outlawed in England, so what are coursing dog owners to do? Some of them are taking their dogs to Ireland where coursing is still legal. Half of the 32 places at Ireland’s Seamus Hughes International coursing tournament in Sevenhouse, Co Kilkenny, are reserved for British dogs and the National Coursing Club is advertising the event on its website according to The Times Online. And, of course, where there are British coursing dogs there are inevitably British animal rights protesters. Activists are also making the trip, with Fight Against Animal Cruelty In Europe’s Tony Moore one of a number of British animal rights activist who will make the trip to Ireland to make their view on coursing known. Whlie there is a natural link between the countries because of the strong Irish connection to coursing in England, this seems wrong. Ireland doesn’t need the problems that these hunting people bring. I don’t think the farmers over there want them either. This is very worrying. We have heard that more than 300 people are traveling to attend the event. This is like a consolation prize for them losing the Waterloo Cup (a British coursing event held since 1836), but English coursers coming over here puts extra pressure on our hare population. Coursing has been suspended in Northern Ireland already because studies there have shown a shortage of hares. War against hare coursing crosses the water to Ireland. Mark Tighe, The Sunday Times, January 1, 2006. Stand-off looms at Sevenhouses. Kilkenny Today, January 4, 2006. The UK’s Home Office released a report earlier this month noting a slight increase of 2.3 percent in the total number of animals experiments country. But at just 2.85 million laboratory procedures involving animals, the number of procedures requiring animals in 2004 was almost half of what it was in the mid-1970s indicating the success of the effort to replace, reduce and refine the use of animals in medical research. Research involving genetically modified animals continued to increase. Thirty-two percent of all animal experiments in the UK in 2004 involved genetically modified animals compared to 27 percent in 2003. The number of research involving non-human primates, however, declined significantly, with only 4,208 experiments involving such animals in 2004 — a 12 percent decline from 2003. There were a total of 2.78 million laboratory animals used in research in the UK in 2004, a 2.1 percent increase over 2003. GM animal tests continue to rise. Paul Rincon, BBC, December 8, 2005.